New grant funded chicken feeders installed! Thanks to an organization called FACT that gives out small grants to farms to help them improve the welfare of their animals, Fifth Crow Farm now has brand new, treadle chicken feeders! … and they’re working!!! Over the last 5 seasons we have struggled to keep wild starlings from eating our chicken feed and harassing the hens. Aside from eating an estimated 20lbs of feed a day (quite costly), the birds are a constant stressor to our two flocks. Rather than migrate away as they should, the wild birds had become a year round presence. In addition to the negative impacts the wild birds have on our chickens, they were also causing significant crop damage when they landed on tender lettuces and plants often shredding and pecking at leaves, making them unsellable. Three years ago we became aware of a style of feeder called a treadle feeder. 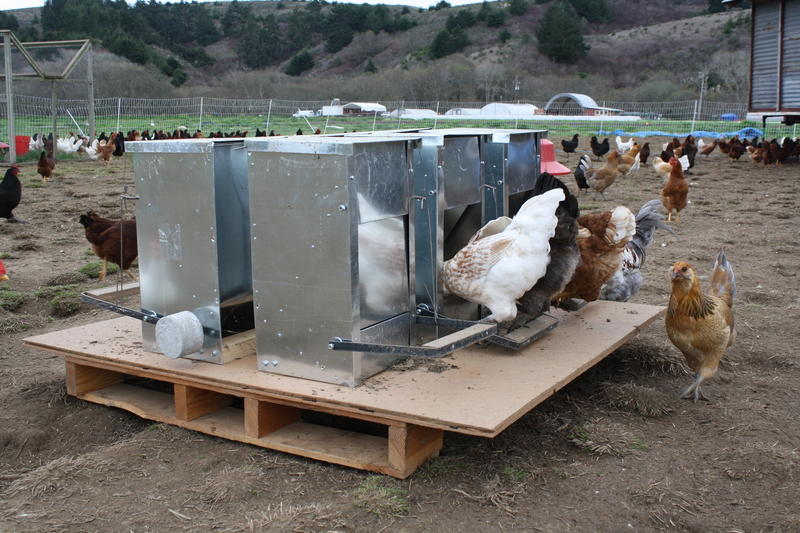 When a chicken steps on a lever at the front of the feeder, the feeder opens and they can eat. When they step off, the feeder shuts. A small bird like a starling can’t get it to open, while a plump hen has no problem with it. Unfortunately the feeders are quite expensive. They’re also not really built for a commercial system, but we’ve improvised. We’ve created units of 6 small feeders mounted to weather treated plywood which is affixed to a pallet so they can be moved with a tractor. We’d still like to improve the design for other commercial scale pastured operations like ours, but for now this is just the ticket! Thank you to all the generous donors that make the Fund-A-Farmer Grants possible.